My daughter loves to help decorate easter eggs and I wanted to do something different this year instead of the classic colored eggs. These Tattoo Easter Eggs are great for younger kids who do not like to get messy, they can have their Easter Eggs the way they want them with out having a mess. 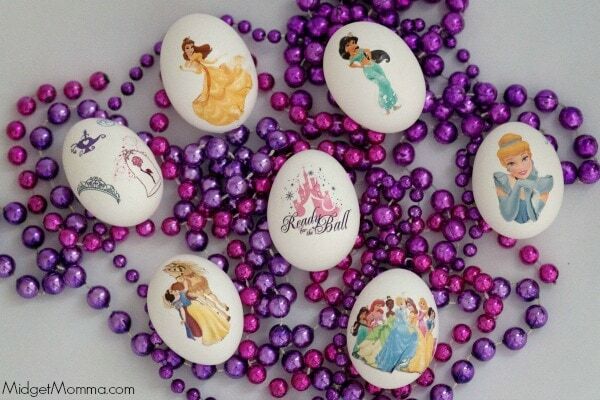 You could do this technique with any character of temporary tattoo, so they can have their favorite Characters on their eggs! I did Disney princesses because they are my daughter favorite Disney Character. I was able to find them here. Place your eggs in a single layer in the bottom of a pot. Cover it with two inches of water. Bring the water to a rolling boil on high heat. Turn the burner off but keep the pot on that burner. Cover with a lid and let them sit for 12 minutes. Drain the water and run the eggs under cool water. Cut out each tattoo you would like to use for each egg. Wet your washcloth with your water. Remove the place from the front of your tattoo. Place the tattoo on the egg and cover it with the wet wash cloth for 20 seconds. Carefully remove the paper from the egg. Repeat with your rest of your eggs and let your egg dry. If you are looking for a special treat make sure you check out my empty tomb cookies it is the perfect cookie for teaching the Easter Story.